The definition of an exulting tongue would be a tongue that is “on cloud nine”! It would be “jumping for joy” as it spoke of the Lord and His triumph over sin and death. Exult exceedingly means to rejoice greatly without limits, or to extremely glorify. 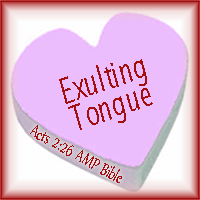 Today as our hearts rejoice, may our tongues exult exceedingly; in praise to the Lord. Dear Lord, my heart rejoices that You are constantly before me, even here at my right hand, protecting me, leading me, providing for me, so that I need not be overcome by my circumstances but can remain in You, secure and happy. My heart rejoices in this and my tongue exalts exceedingly with praise for You, God, my Lord and Savior! “I saw the Lord constantly before me, for He is at my right hand that I may not be shaken or overthrown or cast down (from my secure and happy state).